Long Island Rail Road connection at Greenport is spotty, even though slightly extended during summer months. 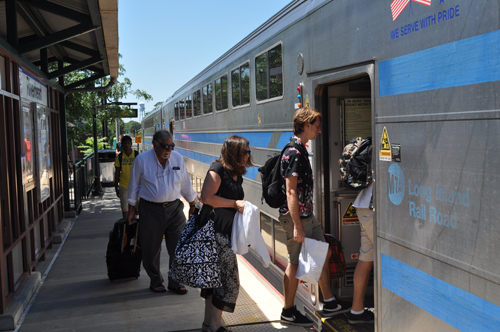 STEVE ROSSIN PHOTO | LIRR riders board an eastbound train out of Riverhead earlier this summer. It’s a summer Friday afternoon and you’re stuck in traffic on the Long Island Expressway, headed from the city to the North Fork. If you’re traveling by bus for Orient, where I live, delays on the LIE could make the trip take as long as four hours. Think this is bad? It could be a lot worse. In fact, more than 260,000 people ride the LIRR on the average weekday. Statistics like that make me a strong supporter of the nation’s second-busiest commuter railroad, Long Island’s best hope for increasing personal mobility while decreasing congestion, consumption of fossil fuels and air pollution. I know, I know. Frequency of service on the LIRR’s Ronkonkoma-Greenport line — the service that matters most to us — is woefully inadequate. But that could change. As previously reported in these pages, funding is now available for the purchase of “scoot” trains on this route. While the railroad has yet to select the equipment it will buy, it’s shopping for trains that would be smaller and cheaper to operate than the current equipment on the Greenport line — a locomotive and two double-deck coaches. Hey, maybe that widely reviled payroll tax for public transit isn’t so bad after all. Even without such improvements, there are ways right now to take advantage of the LIRR that many North Forkers may not realize. For instance, savvy summertime travelers who’ve had it with the LIE can catch the Friday-only 3:55 p.m. train out of Penn Station, fairly confident that they’ll reach their North Fork destination on time. Arrival at Greenport is scheduled for 6:45 p.m. Moreover, on the Ronkonkoma-Greenport leg of the trip, passengers can unwind with a glass of one of the local wines sold aboard the Friday-only train. Unfortunately, that train operates only between the Memorial Day and Columbus Day weekends. But Saturday and Sunday service, once offered year-around but scaled back in 2010 to the same operating period as the Friday-only train, has been extended and will run between April and November. Did I mention the Ronkonkoma solution to getting to Kennedy Airport? If you hire someone to drive you from Orient to JFK, it can cost as much as $150 each way. I’ve got a cheaper way: Drive to the Ronkonkoma station (LIE exit 60), park your car free (for an unlimited time) in the LIRR’s huge outdoor parking lot and board one of the trains operating nearly hourly to Jamaica. Upon arriving there, take the escalator to the station’s mezzanine and walk a few hundred feet to the platform where the Port Authority’s AirTrain departs every seven to 20 minutes for JFK’s terminals. Train fare from Ronkonkoma to Jamaica is $13.50 at peak hours and $9.75 off-peak. Add $5 for the AirTrain, and you’ve saved well over $100. I know; I’ve done it. Some folks who’ve used the Ronkonkoma station tell me they’re worried about missing the train because of the time consumed finding a parking spot in the often crowded free lot. That worried me, too, until I began using THE TIMETABLE. Some people also worry that their cars could be vandalized in the parking lot. Never in the 16 years we’ve left our car there (once for as long as seven weeks) has it been damaged. Our luck did run out last year, however, when two exterior accessories — a rooftop kayak rack and a rear-end bike rack — were stolen. Foolishly, neither had been locked to the car. It seemed like a small price to pay for a service that has worked so well. Orient resident John Henry has been commuting to Manhattan for 16 years, usually using the LIRR’s Ronkonkoma-New York City service. STEVE ROSSIN PHOTO | LIRR riders board an train out of Riverhead about 1:30 p.m. last week. The Long Island Rail Road will extend its summer schedule on the Greenport to Ronkonkoma line by 10 weeks, stretching into November, Metropolitan Transportation Authority officials said. The Long Island Rail Road, through its parent company, the MTA, has been discontinuing all weekend service between Greenport and Ronkonkoma after Columbus Day and before Memorial Day since 2010. Summer service, as it’s now called, will now begin in April and end in November, said LIRR spokesman Sal Arena. After November, there will again be no weekend service between Greenport and Ronkonkoma, he said. “The MTA was able to identify additional money, revenue from dedicated state taxes as well as internal cost-savings, that could be used to enhance train service and other customer amenities,” Mr. Arena said. “The LIRR is making a number of improvements with its share of that money, including the extension of weekend service on the North Fork. About seven years ago, the LIRR was considering discontinuing service between Greenport and Ronkonkoma altogether, but backed off that plan. “This service investment shows that the MTA and LIRR are committed to expanding and improving service to the East End,” South Fork state Assemblyman Fred Thiele (I-Sag Harbor) said of the move. Mr. Thiele has been an advocate for increasing train service on the East End, and one of the projects he has touted also got some money from the MTA. A proposal to establish a network of smaller “scoot” trains between Greenport and Ronkonkoma, as well as in other areas on Long Island, received $37.2 million from the state. Currently, the LIRR is exploring the possibility of diesel-powered Scoot service on the Oyster Bay Branch and on the Main Line east of Ronkonkoma, Mr. Arena said. The $37.2 million funding for such a purchase is in the current (2010-2014) MTA Capital Program, and will remain available even if it is not expended by the end of 2014, Mr. Arena said. “Scoot” is a railroad industry term used to describe a train that would shuttle regularly between the first and last stops on a particular branch or branch segment, according to Mr. Arena. Currently, the LIRR runs only about two trains per day in each directions between Greenport and Riverhead on weekends in the summer, and about three trains per day between Greenport and Riverhead during weekdays, prompting calls from East End residents and officials for better service. “As envisioned by the LIRR, scoot service would allow for more frequent train service than currently provided,” Mr. Arena said. It “would encourage intra-branch and intra-Island travel, but also would require a transfer to electric trains for those traveling on to New York City. The LIRR does not have specific timeline or start date for either purchasing the alternate diesel fleet and/or initiating expanded Scoot service for East of Ronkonkoma, he said.